Pressure Lube International (PLI) is the leading ON-LINE VALVE LUBRICATION & SEALING SERVICE COMPANY that offers total valve care. PLI has more than 20 years experience and specialises in on-site repairs for both large and small operations in Australia, New Zealand, UK and the Middle East. 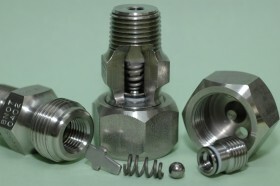 We also manufacture fittings, adaptors, safety tools, pumps and equipment for valve maintenance. PLI has made countless innovations in the valve service market. 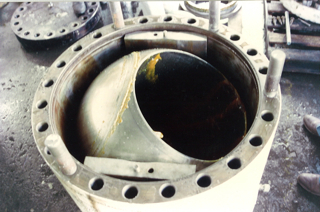 Our program avoids changing out a damaged valve and avoids unplanned shutdown situations. Any valve which has a lubrication/emergency sealing fitting can be worked on. A passing or seized valve can be kept on line by our method of cleaning risers or lube lines, to allow the injection of 100% synthetic lubricants or sealant. Whether on wellheads, production platform or pipeline, the PLI Valve Healthcare Program has proven to increase valve integrity & reduce costs. PLI products, equipment and personnel are available on 24 hour call out for offshore /onshore. 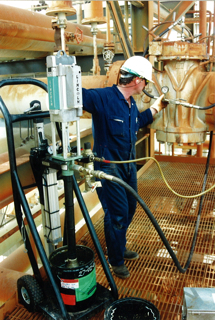 Stephen Bannister on-site injecting one of our maintenance products with a PLI Pump. PLI Fittings – an inside view!